The Royal Natal Yacht Club is the oldest yacht and sports Club in Africa, the oldest yacht club in the southern hemisphere and the 8th oldest ‘Royal’ yacht club in the world. It was constituted in May, 1858 when the first regatta was held in Durban. 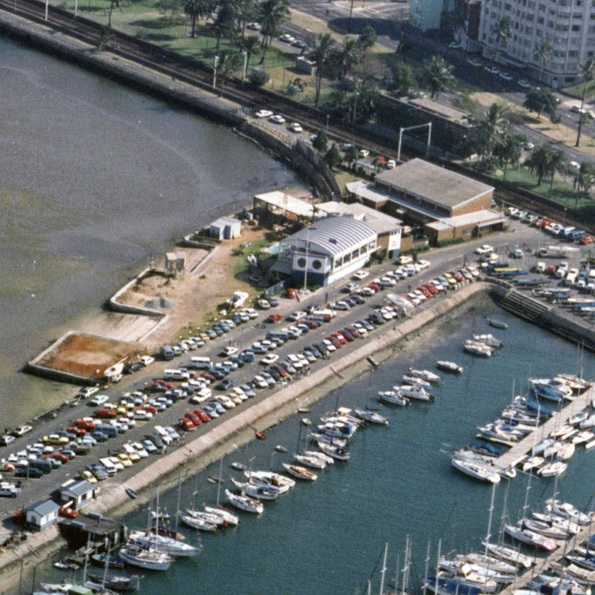 As a result the Durban Regatta Club was formed which later became known as the Natal Yacht Club. In 1891 it received its charter and from henceforth it retained the treasured title of The Royal Natal Yacht Club. On the 23rd June 1835 a public meeting was held among the settlers of Port Natal, at which it was decided to lay out a township and name it Durban. In 1854 Durban was granted its charter. References to yachting on Durban Bay are found in settler diaries dating from the late 1840s. The history of the Royal Natal Yacht Club runs very much in parallel with that of its mother city. From the earliest days of residence at Port Natal, the Bay was the centre of the townships life and Durban’s leading citizens enjoyed the gentlemanly pursuit of yachting. When regattas started is not known, except that in the Natal Mercury of 8th January 1857, a brief news item appeared to the effect that, after a long suspension of this delightful and thoroughly British amusement, it was intended shortly to be resumed on Durban Bay. It was in 1858 that the first steps were taken to place yachting on an organized footing. In May of that year the Durban Regatta Club came into existence and advertised an organized regatta to be held on 28th May. George Russell, in his book The History of Old Durban, records the fact that a half?holiday was granted so that the whole population of Durban, then well under 2 000 people, could enjoy themselves. The boats, which took part, were not designed for racing; Durban Bay had a limited area suitable for yachting, for at low tide it was mainly sandbanks and mangrove swamps. But this was a gala occasion. The wind was light and the tide unusually low, but everybody appears to have enjoyed themselves. This was the birth of the Royal Natal Yacht Club. 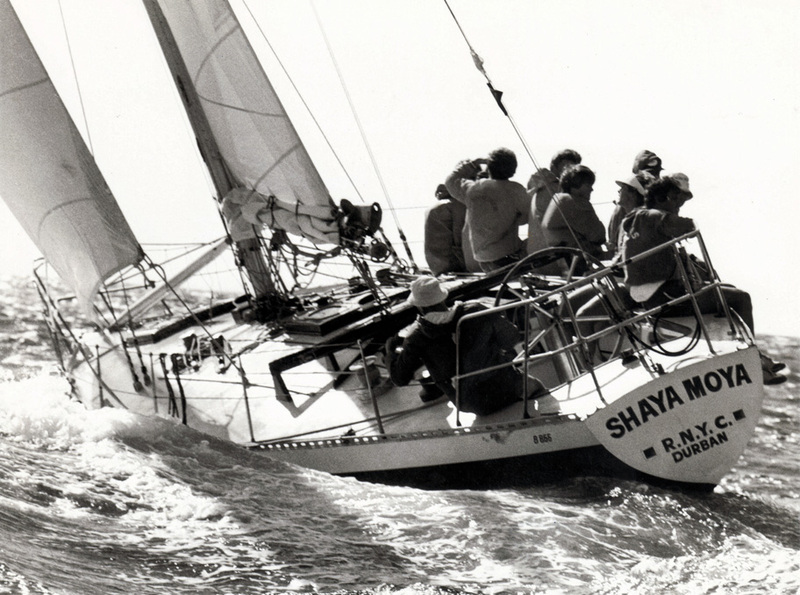 So successful was the regatta that it was repeated in the following year, sailed under rules and regulations which the Durban Regatta Club had drawn up. Mr A. Walsh was honorary secretary and the commodore was Mr Lewis Wilson; the annual subscription to the Club was half a guinea and a committee of seven stewards was elected. The early regattas of the Durban Regatta Club were important occasions for the town and were fully reported by the press. In 1859, 12 boats took part; an appeal had to be made to the public of Durban to keep their pleasure boats well clear of the competitors, the beacons and the course generally so as to avoid interfering with the racing. Everybody who possibly could turned out to watch the regatta and the scenes were reported in flowery language. Regattas continued until 1861, but in 1862 the Durban Regatta Club was in difficulties. There was dissension between certain members and people appeared to be finding more fun in other sports. Soldiering with the local volunteer regiments appeared to be more attractive to the young men of Durban than was yachting. It seems the challenges facing our early founding fathers to attract younger members were no different to what we face today Y perhaps history does indeed repeat itself! In March 1863, the Durban Regatta Club changed to The Natal Yacht Club. Mr. C.J. Cato, who had been its commodore, became commodore of the Natal Yacht Club and men who had been its stewards were elected to similar positions with the Natal Yacht Club. The renewed club at once set about reviving interest in yachting on the Bay and organized its first regatta in November 1863 to take advantage of the longer days. It attracted 13 entries. The rules and regulations of the Natal Yacht Club were first printed in 1863 and the Aclubs distinguishing flag was to be a white pennant with St. Georges (red) Cross a design which is still incorporated in the burgee of the Royal Natal Yacht Club. In those days boats up to 40ft in length with crews of 18 to 20 were common. Bowsprits and booms were very long; there was no counter, but each boat had a huge rudder. Spinnakers were unknown, and the rules of 1863 specifically forbade Athe booming out of sails. From a distance of 150 years it is interesting to look back on the rules for sailing in those days. Starting, for example, must have been a little confusing. The common practice was a fixed line start, with the race officer standing in the judges box on shore. Boats were moored in line with their sails hoisted; as the starting gun fired they were required to haul up their anchors and sheet home their sails. The early commentator, George Russell, refers to the confusion created at each start, with boats fouling each other in the process of getting under way. Original starting rules were changed when the Natal Yacht Club introduced sailing regulations adopted from the Royal Thames Yacht Club, which were amended slightly to meet local conditions. Since 1863, when the Natal Yacht Club took over from the Durban Regatta Club, regattas have been a feature of yachting on Durban Bay. One of the best and most detailed descriptions of these early events is contained in The Days Gone By, by Capt. Alex Anderson, which was published in 1921. Capt. Anderson was present at the 1863 regatta. The course most usually sailed was from the bathing stage which stood approximately where the present Club house is, down to the Point, among the shipping in the deep water, then back to town, up past Congella round a boat anchored at the top of the Bay and down again to the starting point. Whereas today the Bay enjoys a deep water channel, 150 years ago skippers had to be wary of the sandbanks. There are several descriptions of boats stirring up sand all the way during races. 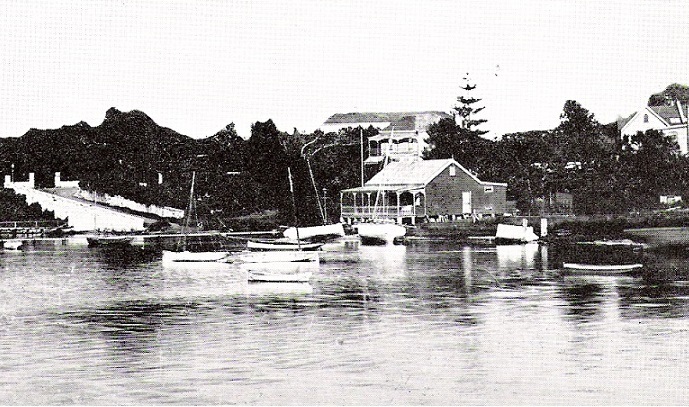 By 1871 the Natal Yacht Club boasted 42 members. These included some of Durbans leading citizens of the day: names like Evans, Craddock, Leuchars, Caney, Robinson, Escombe, Beningfield, Taylor, Goodricke, Acutt and Cato. Thus was the Natal Yacht Club closely associated with the history of Durban and of the Colony of Natal. From the 1870s onwards the club moved steadily, if slowly, ahead. Races on the Bay were organized regularly, with the annual regatta the highlight of the season. Little is known of the types of boat then used on the Bay; many were converted rowing boats; other boats were imported from America, New Zealand and Australia and class succeeded class with bewildering rapidity, the constant superiority of one boat often killing a particular class. As a case in point the committee in 1891 laid down the dimensions for a new 32 foot class to be known as the A5th Class. Within a month it had to be renamed and redefined as the A3rd Class, the previous 3rd Class having become defunct. For many years the club had no home, and from the outset their meeting place was the Princess Café. It was only in 1891 that the first thoughts of a Club House crystallized, and plans were proposed for the erection of a building, 30 feet long by 20 feet wide and 10 feet high. The cost for the imposing edifice built of “wood and iron” was ,150, and a further sum of ,20 was spent on furniture. The first properly constituted Sailing Committee was established in 1901. It was not until well into the twentieth century that the types of boats racing on Durban Bay were classified on international lines and, in some cases, breaking away to form specifically South African classes. One of the earliest of these was the 24 foot scow evolved on the Bay for the interport races with the Beaconsfield Sailing Club of Zwartkops, a boat that was in steady and popular use until the 1930s. The rules and regulations under which racing on the Bay was conducted also changed frequently, depending on changing circumstances on the Bay and to the many different types of boats used. Disputes appear to have been common, and the regulations were several times altered specifically to obviate these and avoid Aany interference with the prosperity of the club. Local rules were brought in, tried out and discarded, and it was not until 1902 that the sailing rules and regulations really became stabilized. In that year the club affiliated with the Yacht Racing Association the name was later changed to the Royal Yacht Racing Association by command of Queen Elizabeth II and from then on the boats belonging to members sailed under the rules of the Association. In 1906, distinguishing marks on mainsails were required for every yacht. On 17th February 1891, a special meeting of the Natal Yacht Club was called, and it was announced that Her Majesty Queen Victoria had graciously approved of the club being granted the title of Royal, and the Royal Natal Yacht Club it was proclaimed. Two months later the Governor, Sir Charles Mitchell, gave his opinion that the correct title should be the Natal Royal Yacht Club. This caused some consternation and some correspondence with the Colonial Secretary, but the matter was finally settled: it was the Royal Natal Yacht Club. The club=s burgee was accordingly altered form the white pennant with the red St Georges cross to its present form of a Scandinavian cross blue red blue and a royal crown in canton. At the same time that the club was granted the title of Royal making it the first Royal yacht club in Southern Africa the Lords Commissioners of the Admiralty granted an admiralty warrant to the club authorizing its members, under certain conditions, to fly the Blue Ensign of the Fleet defaced by the arms of Natal. This entitled them to British Navy protection (in theory, the Royal Navy would send a gunboat if necessary). Flags and emblems play a central role in yacht clubs, as traditionally flags were a vital means of communication at sea and between sea and land. Unfortunately, during 1932 it was discovered that the club was not qualified, from a boat owning point of view, to continue the use of the Blue Ensign and reverted to the use of the Red Ensign. Negotiations were opened between the Club and the Admiralty to permit the club once again to use the Blue Ensign, and permission was given in July 1933 for this to be done. After South Africa was declared a Republic in 1961, some confusion crept in regarding the Royal status of the Royal Natal Yacht Club. Its sister club, the Royal Cape Yacht Club, relinquished its Admiralty Warrant although retained its Royal Charter around this time, and whilst the RNYC never did so, it slipped off the Royal Navy Register. Documentation proves, however, that the RNYC did in fact retain its Royal Charter and Warrant, as this was still in existence in 1964. Recent application to the British Admiralty has resulted in official confirmation of the clubs Royal Charter and all its privileges, and of the right of the RNYC to issue the Royal Warrant to RNYC boats that meet the specified requirements. The Club has been reinstated on the Royal Navy Register. In keeping with its reconfirmed status, it is a founder member of the prestigious International Council of Yacht Clubs. The granting of the Royal warrant prompted thoughts that the club should have its own premises. Tenders were called and during 1891 the first clubhouse was built at a cost of 159 pounds and furnished at a cost of 20 pounds. It was a wood and iron building, on brick piles, which stood on the site occupied by the law courts. In those days the water of the Bay ended in a strip of beach which ran round most of the town side. Piles were therefore necessary to keep the building above water level. The first clubhouse was 30ft long, 20ft wide and 10ft high, floored, ceiled and lined. It had a large club room, a smaller committee room and a dressing room; the following year a new committee room was built at a cost of 20 pounds and 18 shillings, a verandah for 22 pounds and waterborne sewerage installed at a cost of 5 pounds! There was seemingly no official planned celebration of the erection of the clubhouse; the minutes simply reflect a change from the Princess Café, the committee=s old meeting place, to the clubhouse. But it must have been a riotous occasion, all the same. A solemn record of damage having been done to the clubs furniture is recorded in the minutes, as well as a vote of thanks to Mr Caney for having repaired the photograph of the late commodore, which had been Aextensively damaged. Later in the same year the committee agreed to take summary and strict action against members who were guilty of ungentlemanly behaviour. In 1894 the first steps were taken to secure a larger clubhouse to meet the demands of the growing membership. An area of freehold land was bought for 775 pounds, financed by debentures issued to members, and in 1900 a new clubhouse was erected on the corner of Fenton Lane. This was to be the home of the Royal Natal Yacht Club for the next 90 years. The Fenton Road building was altered from time to time, and in 1956 was almost completely rebuilt owing to fire damage. The flagstaff fronting the Club was the mainmast of the barque Sally, which had broken up in Durban Harbour. In 1990 when the Royal Natal Yacht Club sold the Fenton Road property and moved across the Victoria Embankment to its present site, in order to have access to the water, there were still some parts of the old clubhouse which dated back almost a century. Two world wars interfered seriously with the sport of yachting, as Durban Bay was closed to all leisure activities. The RNYC remained open as a Club, however, and each time the end of hostilities was characterized by the development of new types of boats and resurgence in sailing enthusiasm. The 16ft dinghy, developed by Mr G.H. Goodricke in 1924, and the R.E.B. class of 14?foot dinghy named after Mr Rupert Ellis Brown, who was commodore of the Royal Natal Yacht Club for 25 years and who inaugurated this class, are two typical cases in point. Through good times and bad, the Royal Natal Yacht Club has striven to uphold the best traditions of yachtsmanship and provide its members with the means for enjoying a sport second to none in the world. Members of the Club have carried its burgee to all parts of the world, and have competed successfully in many waters, in many types of boats. Some of the club’s highlights over the years include having more representatives than any other South African Club participating in the Olympic games; until recently holding the most wins in the Lipton Cup Challenge; having Martin Lambrecht and Alex Lanham B Love win the 1994 Fireball World Championships under our burgee; Anthony Steward sailing under RNYC colours in his record feat of sailing the smallest open yacht around the world; and blind yachtsman Jeff Hilton Barbour sailing single handled from Durban to Freemantle, Australia; while in the new millennium RNYC members have launched the most 40′ plus size yachts thereby allowing so many new participants to enjoy the sport. In 2008, the club celebrated its sesquicentennial anniversary (150 years). A full programme of events commensurate with the occasion was organised, providing the club with a unique opportunity to leverage its brand and position it as the premier blue water and small keelboat club on the continent. In closing: The Royal Natal Yacht Club represents much of what we should be proud of: camaraderie, friendly competition, the pursuit of excellence and the taking of some responsible risk along with the braving of danger and above all, the ability to have fun.